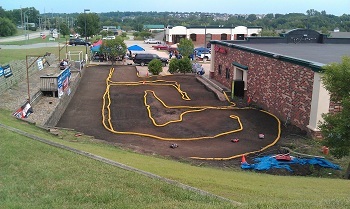 Over the Labor Day weekend I attended the 2011 Hobby Haven Off-Road Shootout in Urbandale, IA. This race is a three day event with open practice on Friday, three rounds of qualifying on Saturday, and on Sunday there was a 4th round of qualifying followed by AAA mains for most classes. There were 10 different classes offered for racers to compete in and this race was entirely an electric event. This is the first time the annual trophy race has been electric only in recent years, but clearly they made the right decision since there was an impressive 225 entries on Saturday. There were drivers from Iowa, Nebraska, Missouri, Illinois, South Dakota, and Ohio so this race has grown from a local trophy race to a regional event. That’s pretty impressive for a race considering they didn’t run any national ads and relied on internet forums and word of mouth. I arrived at the track early Saturday morning to get in a few practice runs before the first round of qualifying began. It rained the night before and the forecast called for chances of rain all day, so the race directors wanted to make sure the race program moved at a swift pace. After a quick driver’s meeting the Shootout officially began. Unfortunately after the 7th heat in the first round of qualifying the rain began to come down hard enough that the track crew decided to halt the races until the storm had passed. Guys were huddled under their E-Z Up tents as the rain continued to pour down for the next couple of hours. Since the race was in a rain delay, and the racer’s spirits were down, the race directors decided to raffle off the many, many door prizes. This year’s race was sponsored by 30 different RC manufacturers and JConcepts was the title sponsor for the third year in a row. There was an estimated $6,500 worth of RC products given out Saturday so every driver walked away with a prize and a smile on their face. As the prizes were handed out the track crew worked diligently to get the track dried out so that qualifying could resume. But soon after they had completed their work on the track the rain came down hard again and washed away any hope of running that day. So the decision was made to move the entire event to the local indoor track, the Electric Pit at Southridge Mall. The track was slightly dried out due to less maintenance performed on it during the summer months so outside tires worked really well on it which was good since many didn’t have indoor specific treads with them. There was a brief period of open practice and registration, and then we ran two rounds of qualifying late into the night. On Sunday the third and final round of qualifying began at 9am and then we moved into the mains. There was some exciting racing action in the mains, especially in the modified 4X4 short truck class. This year’s Stock 2WD Buggy class was also sponsored by X Factory and they gave away an X – 6 Squared conversion kit to the driver who finished the highest with a Team Associated B4. That happened to be top qualifier and overall winner Sam Anderson, so Sam took home the hardware and brand new conversion kit courtesy of X Factory. This year’s Shootout was a huge success despite the poor weather. The race is truly unique considering they have the flexibility to run indoors if needed, plus they always seem to have a ton of giveaways each year. I can’t wait to attend the Shootout next year on Labor Day weekend and if you are in the area I suggest you check this race out too!